My company uses the Univers font as its official typeface and I'm looking for a good Web-safe alternative. The options are limited, but typefaces are really my weak point and I can't tell which ones are more like it. To me Arial looks like my best bet, but there may be subtle differences I'm not seeing. However, using a Web-Font is not an option. I am looking for the most similar base font. Basically what Baka said in comments, and you acknowledged in your edit. If you can't use web-fonts then the default is sans-serif which will probably be Arial or Helvetica for most of your browsers. You could try using Verdana at the top of the stack. But its pretty negligible at that point. 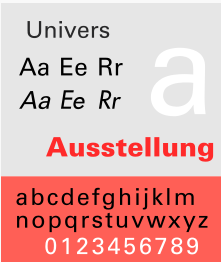 Helvetica is actually closer to Univers so default for a lot of Mac users would be better than Verdana. As mentioned in the comments, "web-safe" isn't quite what it used to be. The best way to be "web-safe" is to use a web font. If cost is a barrier, there are many quality free choices. If hosting yourself is a barrier, then you can use Google's services to do it for you for free. If using an external service is a barrier, then you can download free fonts and host yourself. It was made for the screen and has a robust set of weights. If web fonts are not an option, then the answer to your questions is: use whichever you prefer. None of the font stacks you list are like Univers other than they are sans serif. And that can be OK, but it really is a decision you need to make at this point (though, obviously, I hope, you'll not use Comic-sans). Not the answer you're looking for? Browse other questions tagged font-recommendation sans-serif web-safe or ask your own question. What's a replacement for Univers Condensed? Web Safe Alternative to Myriad Pro Font? Is there a DIN font free alternative? Web safe alternative to roboto?